Xherdan Shaqiri’s famously-protruding calves were on full show as he continued his rehabilitation during Liverpool’s Marbella training session on Wednesday. The Swiss international was continuing his recovery from a minor abdominal strain that saw him miss Saturday’s 3-0 win over Bournemouth at Anfield. It looks increasingly likely he will be available for selection again when the Reds come up against his former side Bayern Munich in next Tuesday’s Champions League Round of 16 first leg. 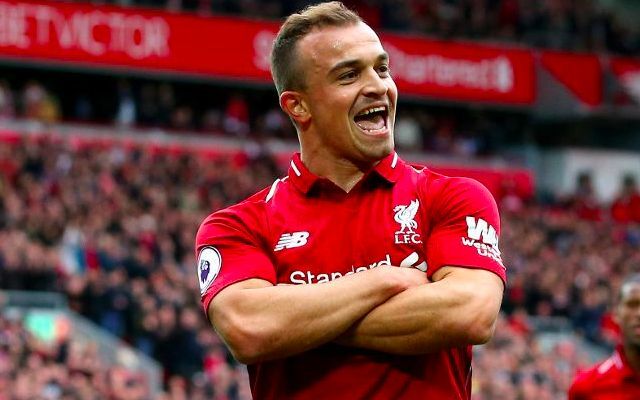 Shaqiri has proven to be a surprise package since his arrival from Stoke City in the summer, contributing six goals and three assists across all competitions as a valuable squad player. Such has been his bright impression that the playmaker has earned seven league starts since the beginning of December, building on his initial role as an impact substitute. His return promises to be timely in restoring some attacking depth for Jurgen Klopp ahead of a busy month of European and Premier League duties.